Are you ready to manifest your dreams into reality? 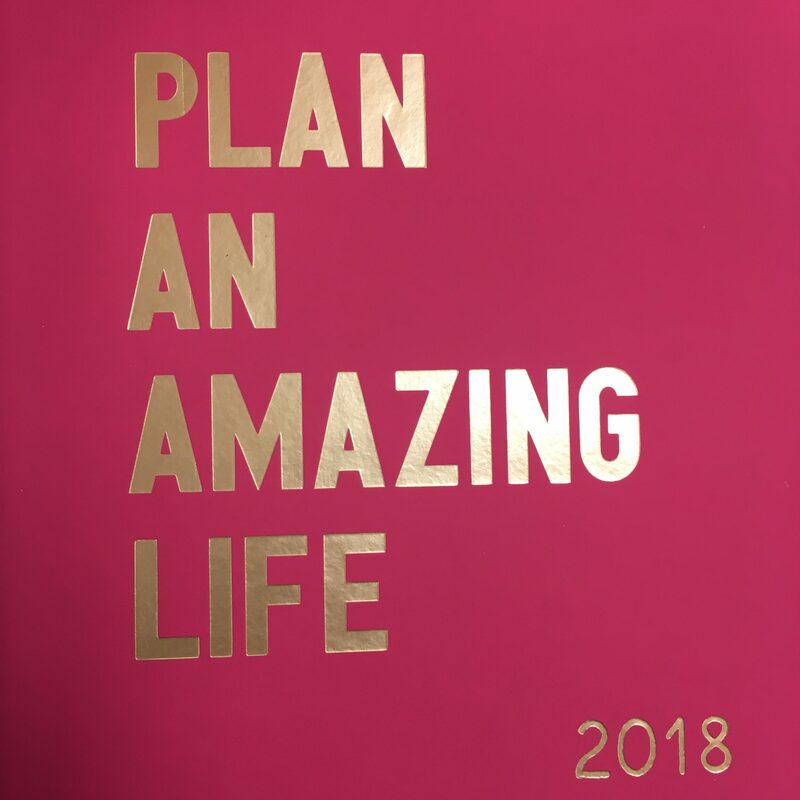 I mean really being intentional with planning your vision in a book, on a board, or even a piece of paper to see it all come to fruition. 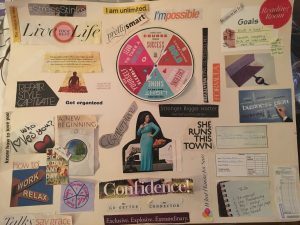 I created my first vision board in 2011, with little direction of how to make one or truly understanding the power they would have in my life. I put “The Lopez Effect” at the center of attention and used words that simply described me as a person. I never imagined that The Lopez Effect would become my brand or a company that I would eventually launch a year later–but the seed had been planted. A year later in 2012, under the coaching of Karen St. Hilaire, I created another board that included the type of impact I wanted to have in the future and the goals I would need to accomplish. The board was divided into into three sections: personal growth, personal impact, life goals. 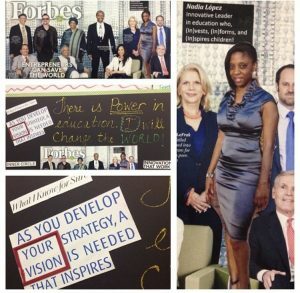 By 2013, I created a board, that was super focused and specific to education by taking a Forbes magazine cover with philanthropists who donate to education initiatives and placed it on the board. I wrote the words “There is Power in Education, I Will Change the World”, then Karen, who once again guided me through the process, said that I needed to see myself in the very place I wanted to be. I put a picture of myself in the middle of the photo and wrote this as a caption: “Nadia Lopez, innovative leader in education who (In)vests, (In)forms, and (In)spires children. A year later to the date, I was featured on the front page of the Metro section of the New York Times for my work in education and creating a school that empowers my scholars to beat the odds they face in Brownsville, Brooklyn. In 2014, I created a vision book, and decided to claim it as my break out year! 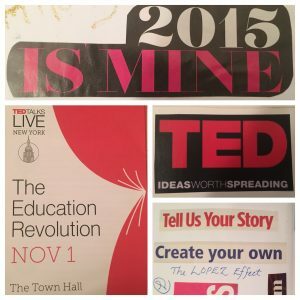 I wanted to share my story, turn The Lopez Effect into brand, write a book, and deliver a TED Talk. Guess What? It ALL happened! A Vision of Your Own: Don’t get caught up in what other people are doing and make that part of your vision. Too many times we get caught up in social media and think, “I can do that too”. NO! What is for someone else, is theirs, not yours. Think BIG and focus on the things you want to accomplish whether it is something old or something new. If you have dreamt it, then you can manifest it, all you have to do is believe and put it down sooner than later to see them come to past. Keep your Vision Close: Everyone won’t understand your vision and the last thing you need is allowing negative energy into your space. You don’t need anyones approval, so protect your dreams and keep your vision in a space is only accessible to you (i.e. your bedroom or private office). 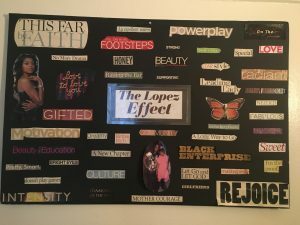 Be Specific: As I shared, my first vision board offered a lot of descriptive words, but nothing specific to what I really wanted or how I would get it. I have learned that what you write or say with great intentions, will manifest eventually. So if you want to start a business, create a board that includes the name of the company or industry you are seeking, find images that are associated with it, you can choose a location or region, and include the type of consumer you want to do business with. If you love to travel, name and add pictures of places you would want to visit, its there a specific purpose (spiritual, cultural, relaxation, self-discovery), and how you will travel (plane, train, automobile). Vision with NO Limits: In 2012 my goals were to write a book, launch my company, and start a blog, they didn’t come to fruition until 2015 and 2106. This is a perfect example of why you must be patient and not easily defeated things don’t happen immediately as you would like. Your vision will happen in due time and when everything is aligned according to God’s plan. Invest in a Coach Now you could do a vision board yourself and get the results you want. But getting a coach was vital to help me focus and get specific on the things I wanted to manifest in my life. Karen has helps me to be reflective and strategic with how I approach visioning, whether that’s on a board, in a book, or something more creative. You are your greatest investment, so get the experts to help you take your vision to the next level.